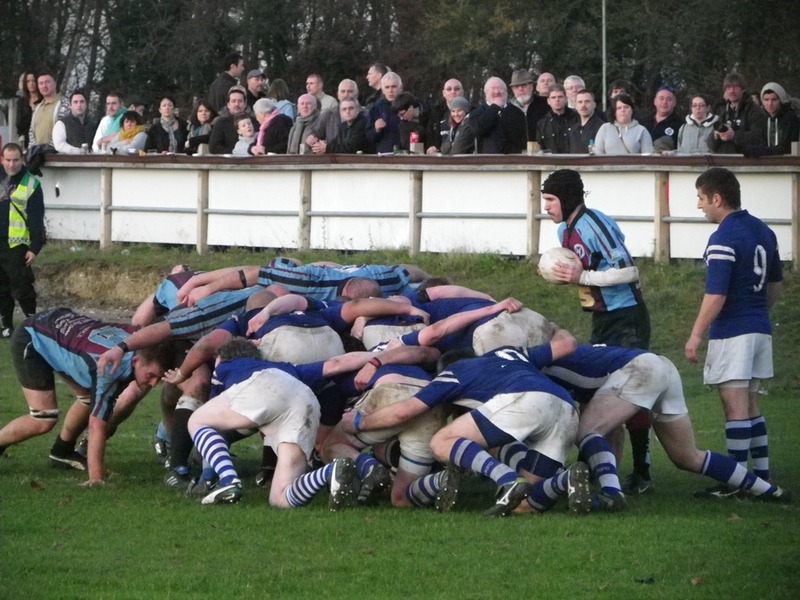 Last season was a tough one for Haverhill & District RFC with a shortage of players, especially in the front row. The club found it difficult to field a second team and almost inevitably the first team called off a couple of games. The decision was made to withdraw from Eastern Counties Division One and play in the Suffolk League Merit Table while the club rebuilt it’s playing numbers. This season has seen Haverhill go from strength to strength with the first team winning five of its games so far with one draw and a narrow loss. Perhaps more importantly the second XV has honoured all eight of its Division Two games also winning five. 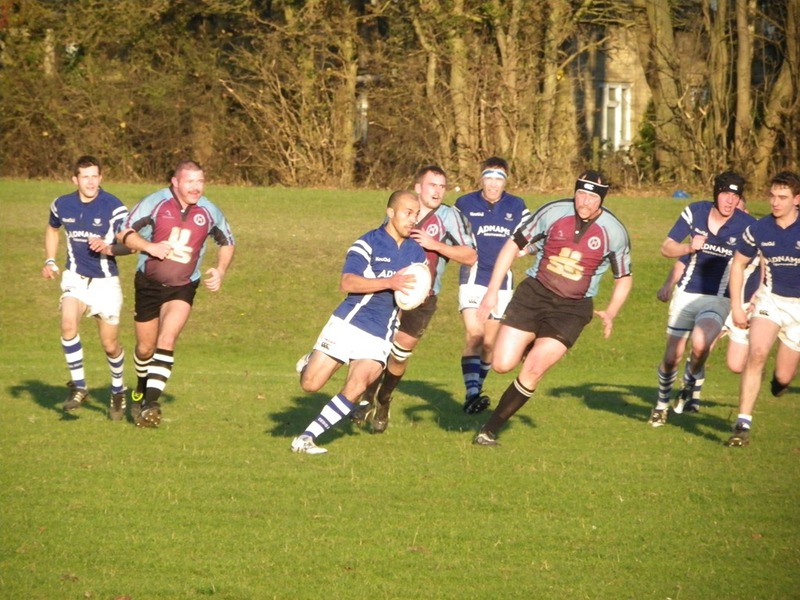 The club hopes to renter the RFU Leagues next season so when I went to watch them play on Saturday it was with an eye to see if they were ready to do so. 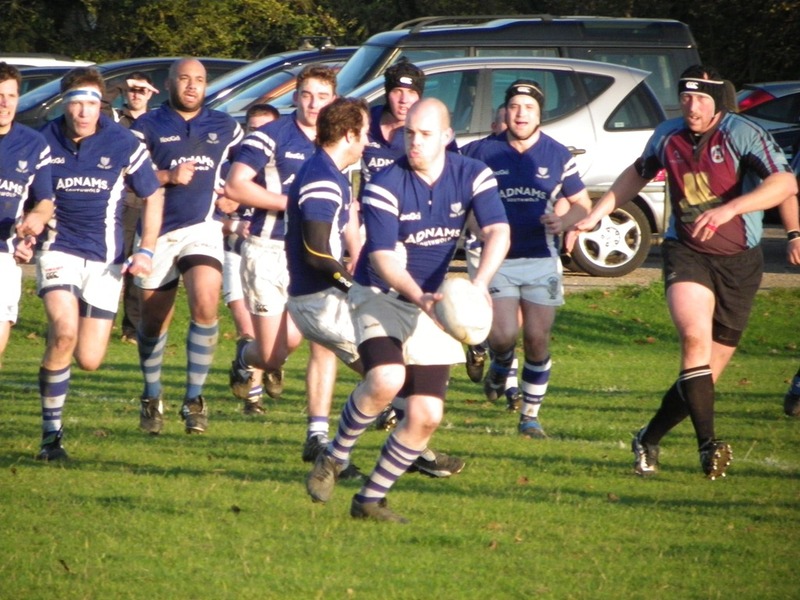 Their opponents were Diss’ 2nd XV, the Saracens, who had a formidable 100% record this season scoring 279 points in their seven Suffolk League games and conceding just 5. Haverhill, or more precisely the Haverhill women’s team, had arranged a ‘Meet the Players’ Fun Day so there was lots going on when I arrived and a decent sized crowd, including many from the youth section, were gathered to lend their support. 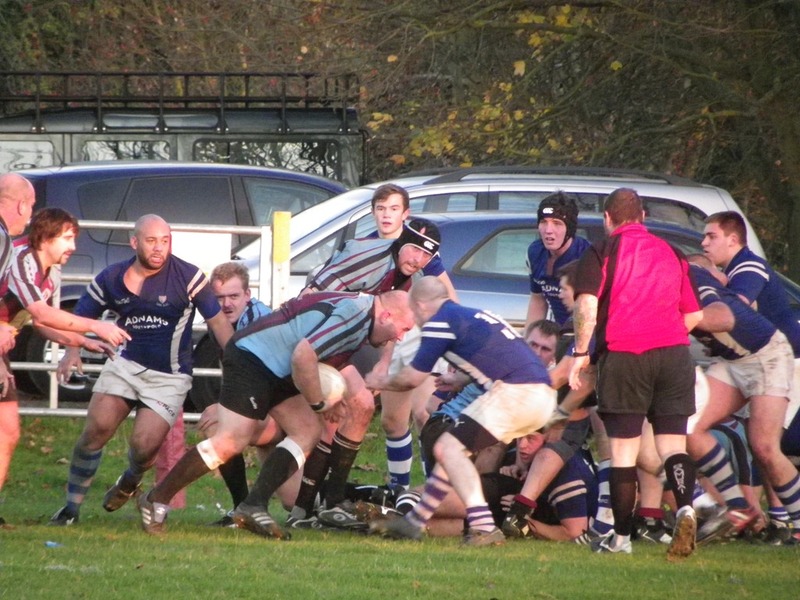 The game saw contrasting styles with the bigger, more experienced Haverhill forwards dominating the scrums, rucks and mauls and the younger, pacier Diss backs looking dangerous when they had the ball in hand. Line-outs however were a bit of a lottery! The game was a tight one throughout with Haverhill taking a 5-0 lead with a forwards try and Diss levelling through their backs. A penalty each side of half time saw the score remain level and although Diss took a 13-8 lead, Haverhill dominated the last 15 minutes and would probably count themselves unlucky to score only one converted try and not come away with more than a 13-13 draw. The result is an important one for Haverhill as is confirms that they are getting back on track with their playing strength and it will do no harm when their application to rejoin the RFU leagues is considered. But it is also significant for a much wider reason and that involves Diss Saracens. Diss’ second team has been struggling for fixtures over the past couple of seasons. A while back the team competed in the Norfolk Merit Table but the opposition was too week, and they tried a season in the Suffolk League with much the same result. When the first team was promoted to Level 5, currently named National League Three London & South East, they decided to put the Saracens into the second team league that mirrored the first team fixtures. This league covers all of the London & South East area and although they were determined to travel as far as they needed to to honour their fixtures, they expected, perhaps naively, that the opposition teams would do the same. But London-based club players view Norfolk as almost another continent and increasingly games were called off until Diss’ own players wondered why they should make the effort when it wasn’t reciprocated. When Diss were relegated to Level 6 at the end of last season they rejoined the Suffolk League and until last Saturday had found it all too easy which may look good for the stats but doesn’t help player development. Most club coaches will agree that a strong first team needs a strong second team to support it and Diss are rightly concerned that the quality of their second string players will decline without regular challenging games. Over this time Diss, along with North Walsham who have similar geographic problems with visiting teams calling off, were lobbying Eastern Counties and the RFU to do something to help their plight, but opposition of suitable quality cannot be conjured out of mid-air. In one or two areas of the country, 2nd XVs play in the lower tiers of the RFU Leagues and this is something that has been explored in Eastern Counties and for obvious reasons Diss and North Walsham are keen on it being implemented locally. For me, the significance of the 13-13 draw between Haverhill and Diss Saracens is that the first point above can be refuted. It is rare for Eastern Counties League first teams to play London League second teams so for a non-league team to draw with a Level 6 second team does imply that the gulf is not as great as some fear. The second point is a much harder one to deal with but grass-roots clubs foster great loyalty from their players and I am not convinced that this is as great a problem as some think. Realistically, the clubs that that would want to enter 2nd XVs into RFU leagues are likely to be North Walsham, Diss, Bury St Edmunds and Colchester, although the latter’s second team get a competitive standard of rugby playing in the Essex Merit Tables. A way forward may be to engineer some games between the second strings of the above four and first teams in the Eastern Counties Leagues and see what results are like. On Saturday’s evidence they may be closer than expected. It’s a sensitive issue and I would welcome other opinions. Just click the ‘Leave a Comment’ link at the top of this article. I do think that the Clubs in EC should loook again at the “Sussex model” whereby 2nd, 3rd & 4th XV’s can compete in the equivelant of EC1 and EC2 (and EC3 N,S, E & W), alongside other clubs 1st XV’s but not be eligible for promotion beyond EC1. Players want competitive games, not big wins or a tonking. Of the 73 games played this season in EC1 & 2, only 35 (48%) can be seen as competitive (winning margin 20 points or less). 25 (34%) had a margin of 21-40 points, and 13 (18%) were won by more than 40 points. A 40+ win or defeat is not fun for either the tonker or the tonkee! Tony Alston , President Diss RFC 21Nov 2011 11am. A good article from Andrew. I hope Clubs from EC1 will respond positively, so that progress can be made. We have/are trying to pick up the odd team out in EC1, but last attempt was a Thurs eve calloff by that team. Call-offs: that is another problem that needs addressing at RFU level. ‘Play or Pay’: a modest penalty would discourage teams from calling off. It is better to have 25 men running around than none, and perhaps an empty clubhouse. Just one minor correct here, Haverhill were never behind in the game against Diss and were very disappointed for not having taken all the points available. Travelling home and away for Haverhill games over a number of seasons, last season was not the best at all, but we still turned out to support the side. The big problem we faced at Haverhill was that, without a functioning second team, (and even when we got one, the opposition normally cried off) and the first team playing in EC1, the prospect of bringing some of the young talent into the senior rugby side was just impossible due to the gulf between their levels. By dropping the levels and restarting the second team, we are able to allow our younger players a chance at senior rugby through the seconds. What has been nice this season is that we have gone and played sides like Bury, Diss and Colchester, something denied us when playing EC rugby. And why is this? Because their first teams play in London Leagues and they are not allowed to have a second team in the EC leagues. I can understand some clubs reticence here and possibly the clubs in the higher leagues have themselves to blame. Two weeks ago, Haverhill 2’s had a game against Ipswich YM3’s at Haverhill. The score line was convincing to Haverhill. What I did like about the game though was the fact that the Haverhill first team were not playing that day. The temptation could have been to pack out the second team with first team players and to have completely annihilated the opposition. This was never even considered by the club, as we want our two’s to flourish and to also get home games as well as travelling away from home. This maybe cannot be said for other clubs this season when it turns out a third team Haverhill were supposed to be playing was in fact most of the second team whose friendly had been called off, with a liberal smattering of first team players too. What was annoying was Haverhill were away from home, dominated the game and but for a two minute spell of two converted tries in the second half, would and should have won the game. We should have had 20 points on the board in the first 30 minutes. And this is the clubs reticence of allowing higher leagues second teams (or even third teams) into the RFU competition. Will we be turning out against a side that is largely their first team (as they do not have a game this week) or it is packed out with “returning from injury” first teamers? I still play a lot of cricket and in these leagues, certain players are registered and can only play for the first team and are not allowed to play for the second team, without there being a points and fine sanction if caught. I am sure that something like this could happen in rugby to alleviate the fear of playing League 5 or higher players. There is the argument that, if that player has been injured and is returning, a run out for the two’s is a good way of ensuring match fitness. This is only right in my opinion but needs to be policed in some way, getting dispensation for the match. However, while teams do not play with a straight bat with selection, then the reticence of other teams in the RFU leagues will continue and “NO” will be the watchword of this subject. For me, it is a no brainer. I think these teams should be allowed to compete. It gives them the competition for the players to grow and allows their lower teams to move up the merit tables. It would be nice to think that this could be done on a “gentlemen’s agreement” to ensure players of the higher leagues do not end up in the EC games, but history does not seem to point in that direction. However, putting in the right process to avoid this taking place may alleviate the fear and making sure that the sanction for breaking this is right for the offence. However, the problem with rugby is that, being on the wrong end of a cricket score can be career threating if the gulf between abilities is too high. However, we are aware that there is concern from some of the smaller clubs that the big may just get bigger.